“PB, Herman, we’re not there, yet. We’re still in Houston.” Her Authorship laughed. “We’re only 18 miles from home.” Herman decided to burrow deep into the backpack for a nap, but Plot Bunny was eager to explore his new surroundings. 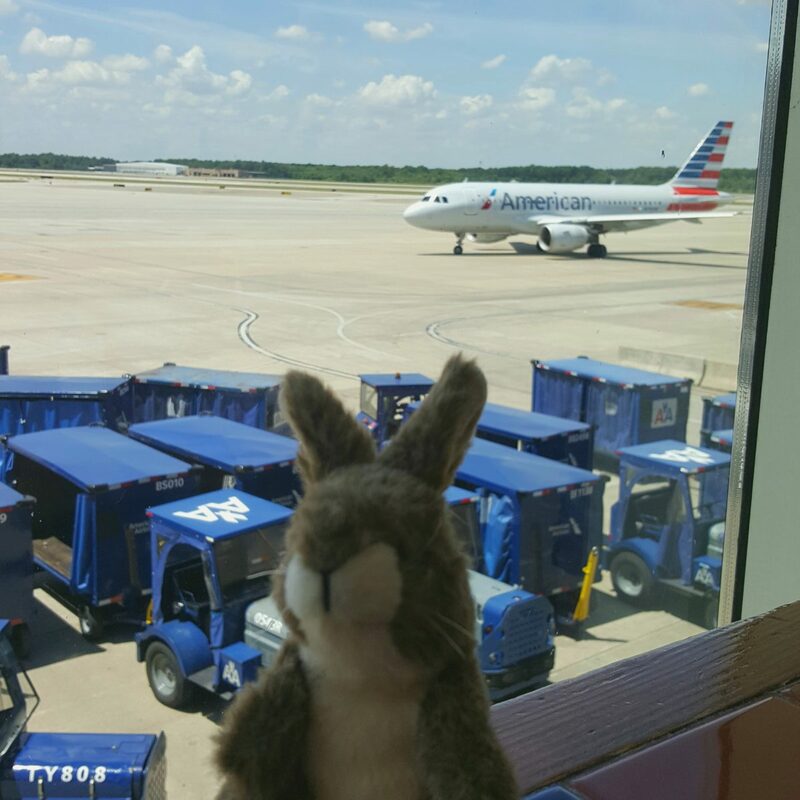 Plot Bunny watched the planes taxi to the gate and to the runway and up, up, and away! Finally, it was their turn. They boarded the flight to North Carolina. They waited, and waited, and waited some more. “No, Plot Bunny, we’re not there, yet. We haven’t even left the ground.” Thunderstorms in Charlottesville had grounded all air traffic in and out, and although the weather was clearing, there was a backlog of delayed flights and planes still waiting to land. Eventually, though – about an hour and a half late – they took off. Plot Bunny would like to lie and tell you that Her Authorship didn’t sigh a great, dramatic sigh of put-upon-edness, the fifty-bazillionth time he asked. He would like to lie and tell you that she was The Queen of Infinite Patience, but instead, she stuck him unceremoniously into her backpack and ran for the next terminal, the King of Forbearance hot on her heels. They had made it as far as Charlottesville, de-planing at the exact moment their flight to Paris was due to leave. But it hadn’t left yet, so Her Authorship fairly flew towards the gate. She needn’t have bothered. 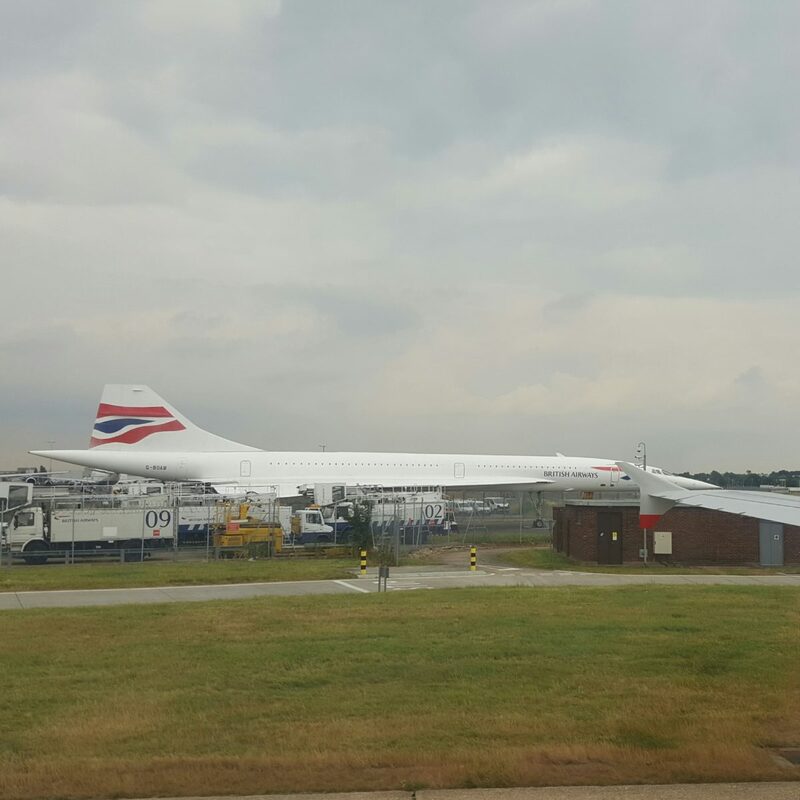 The flight to Paris had taken off as they were running to the gate – a mere three or four minutes before they could reach the jetway. 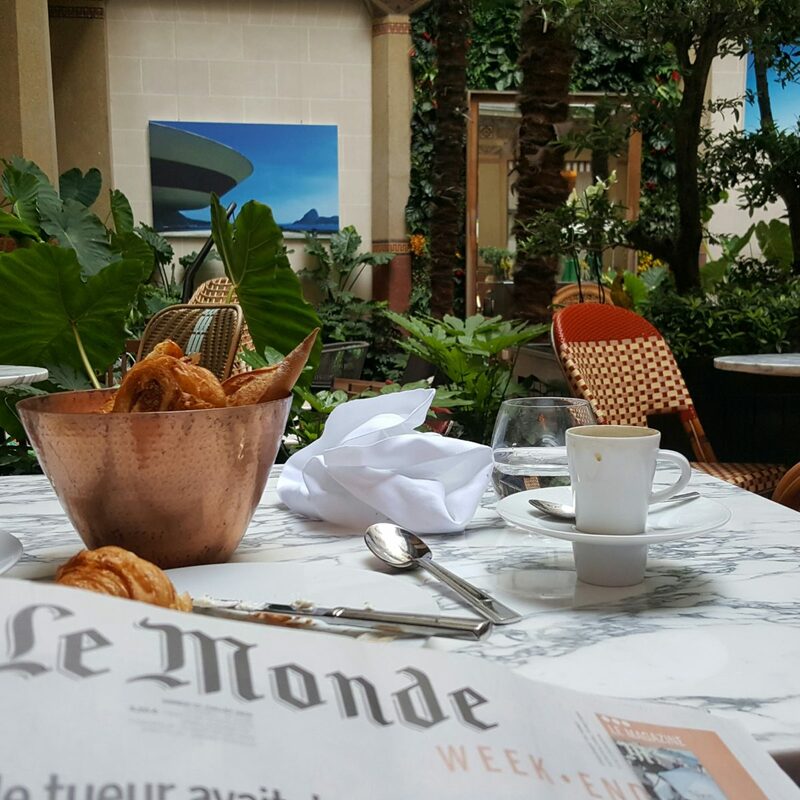 Logic dictated that this was A Good Thing, since retrieving their luggage from a later flight – almost an inevitability in this particular multiverse – would have created numerous hassles at Charles de Gaulle airport the next day. Better they and their luggage arrive at the same time. Still, it was Most Irksome. Logic, this late in the day, was not Her Authorship’s strong suit. She did not want to go to Heathrow and waste the better part of a day staring at an airport she’d once spent seven or eight hours in. By Her Authorship’s calculations, she had spent more time in London’s Heathrow airport than she ever had in London, outside of it. It wasn’t that interesting of an airport, she thought grumpily. “I don’t know why she’s taking it out on us,” Plot Bunny muttered to Herman Hootabout. “Better that than to throw a hissy fit in front of an air marshall,” hooted Herman wisely. Her Authorship had tried to behave, but old grudges die hard. US Airways might never redeem itself, but it would be nice if they gave it even a half-hearted attempt. Her Authorship tried to nap on the plane, but the passenger behind her kept poking her seatback with a stabby finger in an attempt to make his selection on the entertainment console’s barely functional “touchscreen.” She had to explain to several passengers that angrily jabbing at the thing – particularly with the middle finger – would only make it utterly intransigent. The only working solution she found was to gently push upon a spot for about 27 to 36 seconds and hope it registered the proper location and didn’t do something stupid, like call up the little airplane on a map when you were aiming for a foreign film. She watched bits of several movies and made a new friend, and at last, they were served a light breakfast and watched the sun rise over London. 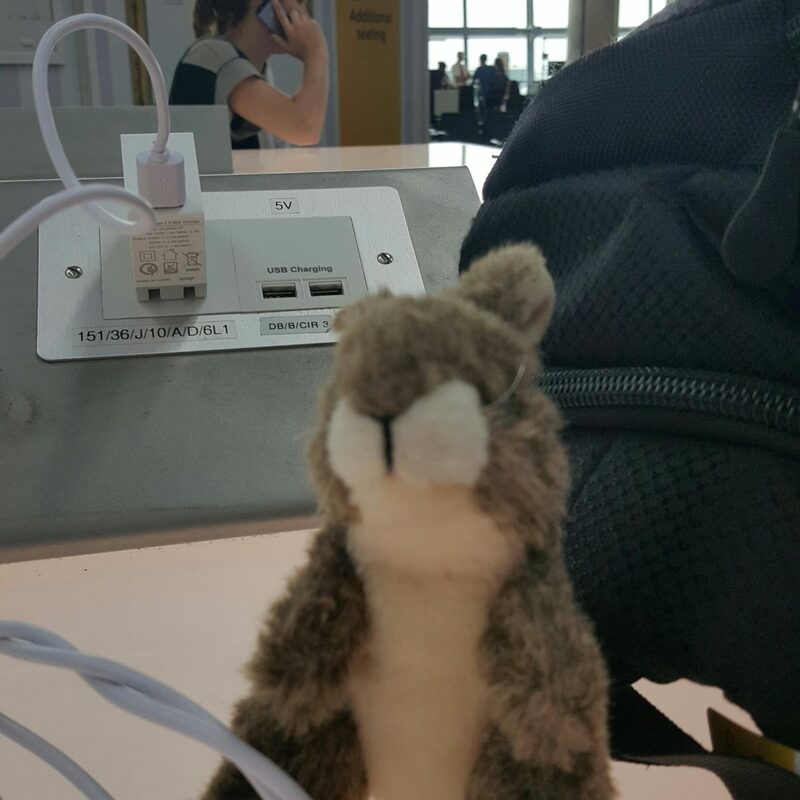 Afterwards, they sought out power outlets – there having been none on the plane – and found many, but none of them worked. They arrived in Paris just in time to check into their hotel and have a fine dinner with an excellent view of the Eiffel Tower all lit up like a sparkler atop a birthday cake! Herman Hootabout and Plot Bunny stayed behind in their room at the super-sumptuous Prince de Galles Hotel, and checked out all the 5-star amenities. They were fast asleep by the time Her Authorship returned, and she soon joined them in dreamland. ← Previous Previous post: Stowaways! Missing a plane is a lot more fun as part of a story. Good choice of traveling companions. Fantastic! I’m glad I had the opportunity to follow along on your trip. I recognize the egg and tomato, but what was the other food? Portobello, bacon, potatoes, sausages, and beans. 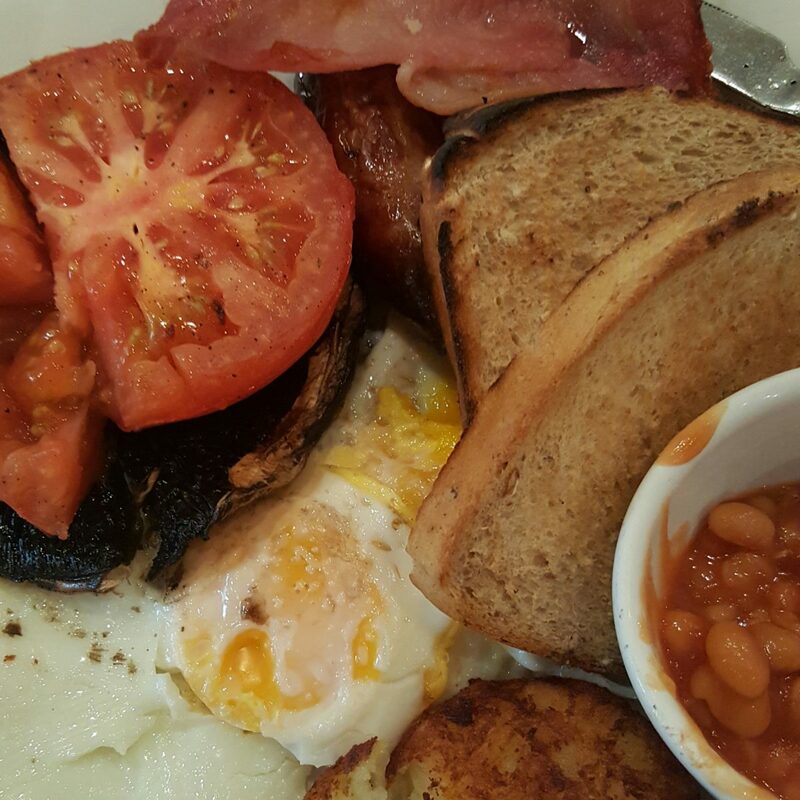 Beans are part of a proper English breakfast! Also, dinner: double eggs, chips, and beans. Dee-licious! Marian Allen recently posted…Should Be #Vegan. Should Be Kosher. But FAIL FTW.